Physicians must inform their patients of the medically reasonable treatments available for their condition, and the patient then reserves the right to choose how to be treated. But this can be impossible if the patient is unconscious or otherwise unable to communicate adequately. With an advance directive, you can specify which types of treatment you want to receive in advance. You can appoint a health care proxy who will make all the medical decisions you would be able to make if you were competent. The proxy will have the right to review your medical records, admit you to or discharge you from medical facilities, and consent to or refuse any medical treatments, potentially even life-support treatments. Given the proxy’s power, you must be sure this person is willing and available to make medical decisions, understands your values, and will be able to advocate on your behalf to pursue your desired treatment. 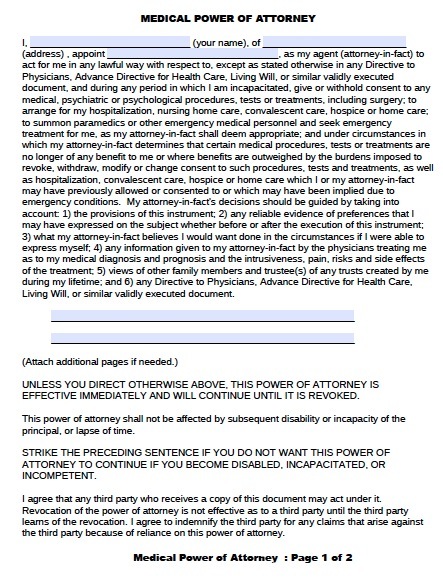 A living will enables you to state your preferred treatment in the event you become permanently unconscious or suffer from a terminal condition. On Oklahoma’s standard living will, you can choose to receive no life-sustaining treatments under these conditions, all life-sustaining treatments, or only artificial nourishment. You can also authorize that you would like to receive as much pain medication as needed without regard to whether it would hasten death. Further, you can state that you do not want specific procedures like dialysis or blood transfusions.